How do I change my address, e-mail address or phone number? You can change your address, e-mail address or phone number on record at Bank 1st by completing a Change of Address form. Online – Click here to obtain the form. Complete, sign and return the form to the bank. Once we have received a signed and dated change of address form we will update our records with your new information! What is Bank 1st’s fax number? Bank 1st’s fax number is 563-422-5356. What is Bank 1st’s mailing address? Our mailing address is 115 N Vine, West Union, IA 52175. What are the bank’s holiday hours? How can I redeem savings bonds? Bank 1st offers bond redemption at our downtown location and our St Lucas branch. We redeem Series E, EE and I bonds over the counter. We can also assist you in redeeming your Series H & HH bonds. Two forms of identification may be required to cash savings bonds. Can I purchase savings bonds at the bank? No, as of January 1, 2012 banks no longer sell paper savings bonds. Please visit www.treasurydirect.gov to purchase savings bonds. What are the bank’s cutoff times? Does the bank sell certified checks? No, Bank 1st sells money orders. 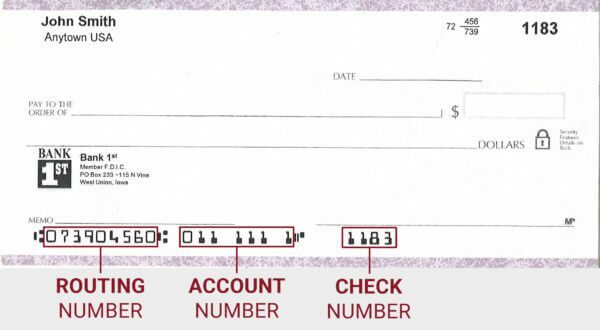 Money orders are very similar to certified checks as upon purchase the bank immediately debits the desired amount from the purchaser’s account and places it in its own reserves to guarantee the funds. The money order, however, is not signed by a bank representative but rather the purchaser. For further information about money orders, refer to the Money Order page of the website. Yes. Please refer to Notary Services.